As you might have guessed, the fact that I’m growing two little human beings inside of me (both girls!) means that I won’t be traveling any time soon. Still, even though my passport will be on hiatus for a bit, my blog is gearing up for some serious catch-up action. I have a whopping 27 unpublished posts in my blog’s “draft” folder and countless more in my head from all my past travels. Since we were staying just a 15 minute walk from this one, where people from all over the Middle East come to sell their wares, we checked it out on our first morning. The walk was pretty hot (made worse by the fact that I had opted to be culturally appropriate and therefore didn’t have the easy breazyness of tank tops and above-the-knee skirts) but once we got to there, the old wooden arches shading us from the sun made the market much more bearable (and beautiful). The souk was full of men from Pakistan, Afghanistan and lots of other places ending with ‘Stan” selling pashminas and… I guess other stuff too… but something about us must have screamed, “We have a serious lack of pashminas in our lives!! !” because that was pretty much all they were using to entice us. Truth be told, I didn’t really need a pashmina so their efforts were wasted. Still, we might have caved and bought something had their selling tactics been a little different. Andy can be a little jumpy and he didn’t really respond well to strange men coming up behind him and wrapping things around his neck. He may have suffered a handful of mini-heart attacks, but I found the whole thing hilarious. The salesmen, however, were mostly just baffled by his aversion to things being cinched around his neck. 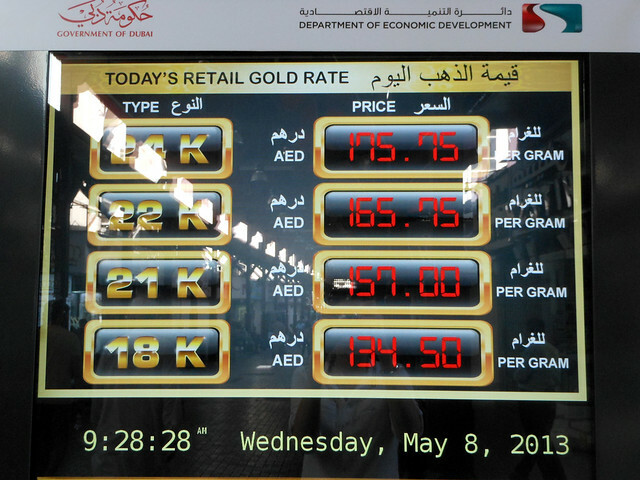 The second souk we saw was one strong-smelling market – but in a really good way. The intense aroma mixed with the heat and the background babble of foreign languages made for a distinctly foreign experience… the kind of experience that, when you think back to it, will give you the warm fuzzies and the urge to travel. 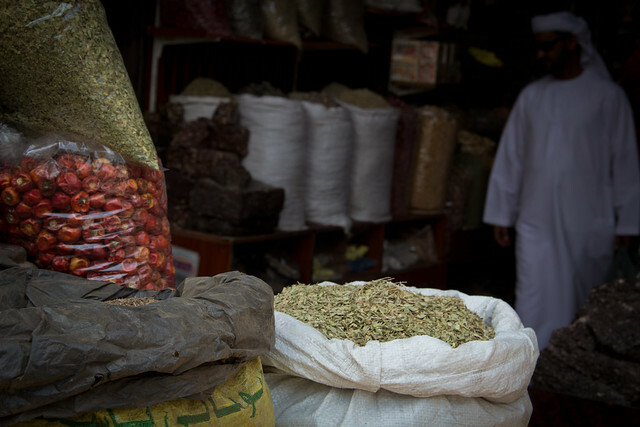 The Dubai spice souk. (C.C. image courtesy of virtualwayfarer via Flickr.) If the aroma here was intense, I can’t imagine the aroma the perfume souk, we we didn’t get a chance to hit. Maybe next time. 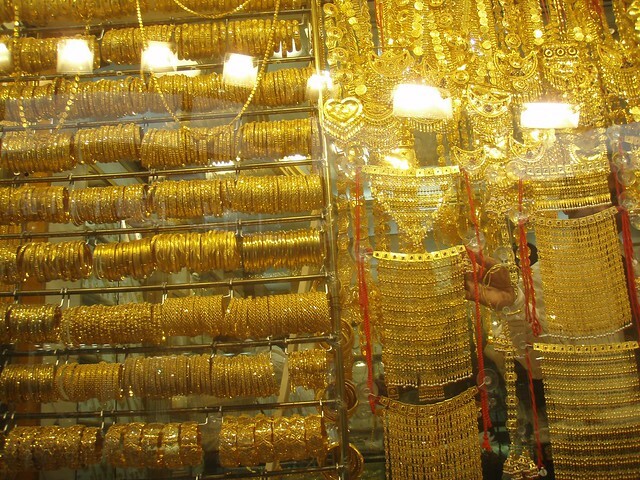 I’ve never really been partial to gold jewelry but holy cow, did this place change all that. Actually, it made such an impression on me that I wore my one pair of gold earrings every day for the rest of the trip. We got there right as the market was opening and as store after store lifted their shutters and shined up their displays, both Andy and I agreed that all that golden bling was indeed dazzling. 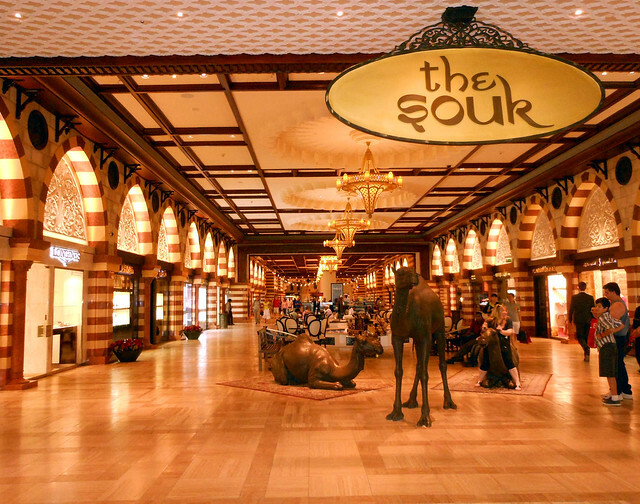 Just as the name suggests, this souk is actually inside the massive Dubai Mall. 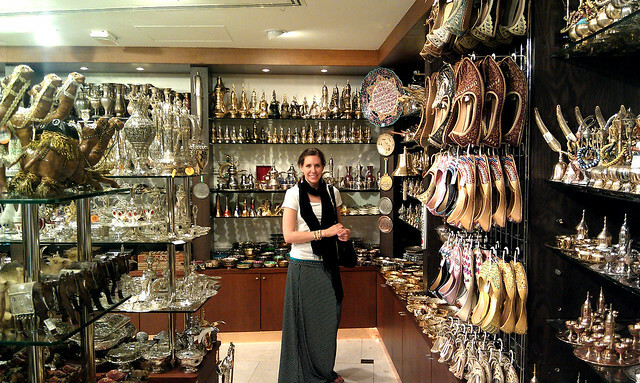 It is a lot less ‘traditional Arab marketplace’ and a lot more ‘place to buy kitschy souvenirs’ than the others. 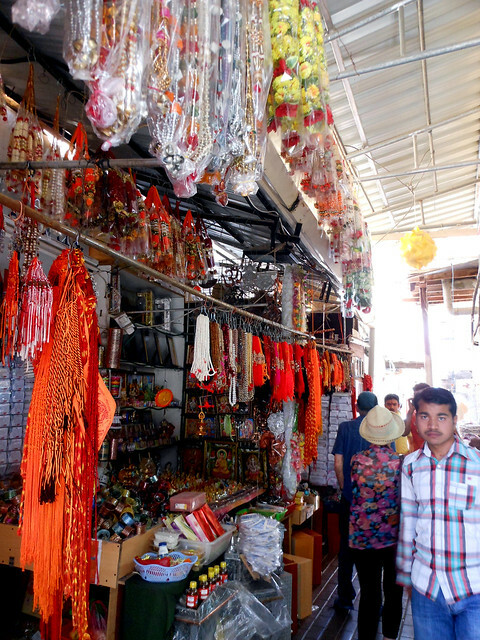 We were at the mall to check out the world’s tallest building and while we were there we took refuge from the intense mid-day heat and did a little shopping – which was when we stumbled upon the souk. 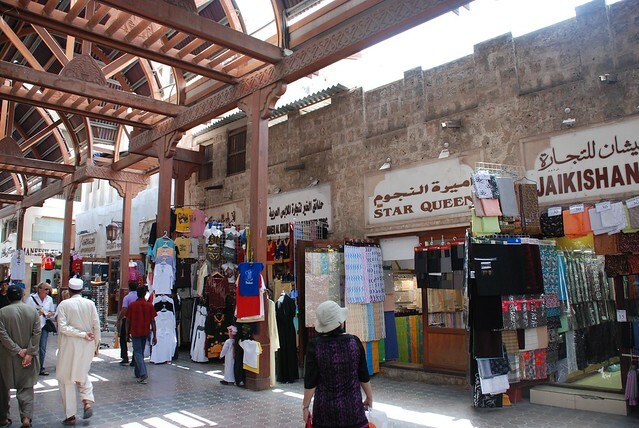 I had mentioned to Andy that when I’d been doing the research for the trip, several websites and forums had listed the mall’s souk as a safe and easy alternative for those who aren’t comfortable visiting the real souks in the city. 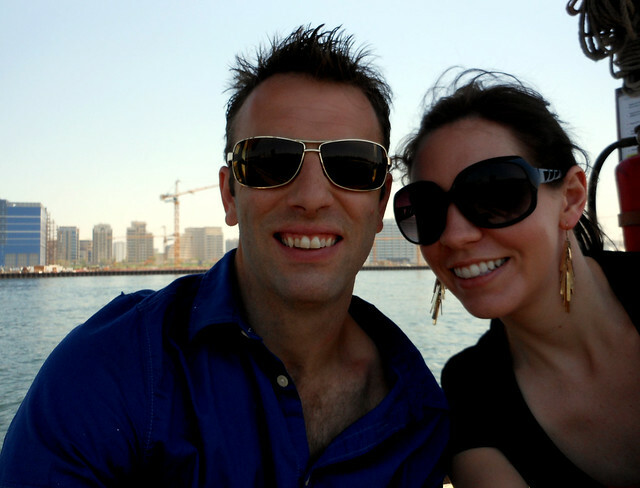 For those of you who haven’t been to Dubai, this sentiment is downright laughable. To give you some perspective, I’m not the kind of person who usually just loves markets. I absolutely hate haggling, pushy salesmen make me uncomfortable and I don’t thrive in hectic environments. In short, while I see their sightseeing merit and I have enjoyed visiting some, I have also found myself unhappy and overwhelmed in markets all over the world. Having said that, the other non-mall souks in Dubai’s were anything but unsafe or difficult. In a way, I guess this last one relates back to my take on all the cheesy, over-touristy things that I noted on our recent trip to Jamaica. I’ve been all over and let me assure you, you can find that level of bright, shiny, watered-down touristy crap anywhere – but don’t be fooled by weirdos online, seeking out the real deal gives you a much cooler experience. That is, unless you hate haggling and are actually trying to buy something. If that’s the case, you should still check out the atmospheric markets, but afterwards you have my blessing to pop into a place that actually lists their prices to make a purchase. Don’t hate me, but a price sticker (even if it’s grossly inflated) still makes me happier than haggling. An added perk is that easily-startled husbands don’t feel like they’re about to be strangled. It’s so hard and it goes against every bone in my body! I know tons of people love it and it’s so common some places but for me, it’s just so hard to feel like it’s anything but someone lying to me about a price, then me having to call them on that lie, then them lying to me again and so forth until we settle on something that still may be a lie. It’s a great skill and some people have it and some don’t. I, clearly, do not.